It’s taken a hundred years of human-caused greenhouse emissions to push the global temperature up almost one degree Celsius (1C°), so another degree is still some time away. Right? And there seems to have been a “pause” in warming over the last two decades, so getting to 2C° is going to take a good while, and we may have more time that we thought. Yes? The world could be 2C° warmer in as little as two decades, according to the leading US climate scientist and “hockey stick” author, Dr Michael E. Mann. 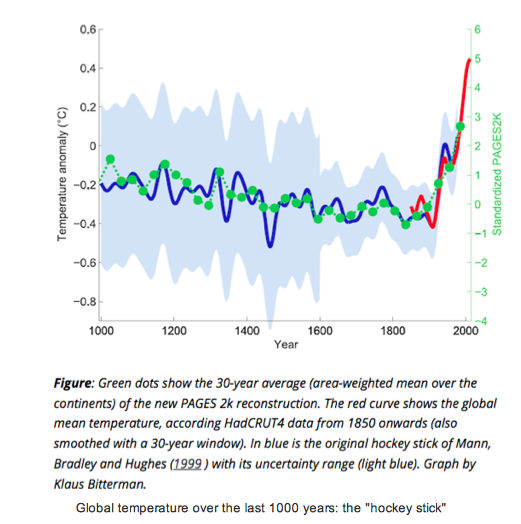 Writing in Scientific American in March 2014 (with the maths explained here), Mann says that new calculations “indicate that if the world continues to burn fossil fuels at the current rate, global warming will rise to 2C° by 2036” and to avoid that threshold “nations will have to keep carbon dioxide levels below 405 parts per million”, a level we have just about reached already. Mann says the notion of a warming “pause” is false. Continue reading about why 2C° could be just 20 years away here. “Global Warming” or “Climate Change”: Does it make a difference?